Voting Members are 18 years of age and over. In order for Members to vote at the Annual Meeting, they must be members in good standing both for the year for which such annual meeting is held, and for the proceeding calendar year. A junior is considered under 18 years old as of January 1st. Special Needs are exhibitors in the Special Needs departments of the Home Crafts Division. These memberships do not have voting privileges. All exhibitors participating in the Barrie Fair and the Essa National Draft Horse Show must be EDAS members to exhibit. All participants in the Lord Simcoe Series who wish to accumulate points for year end awards must be EDAS members. 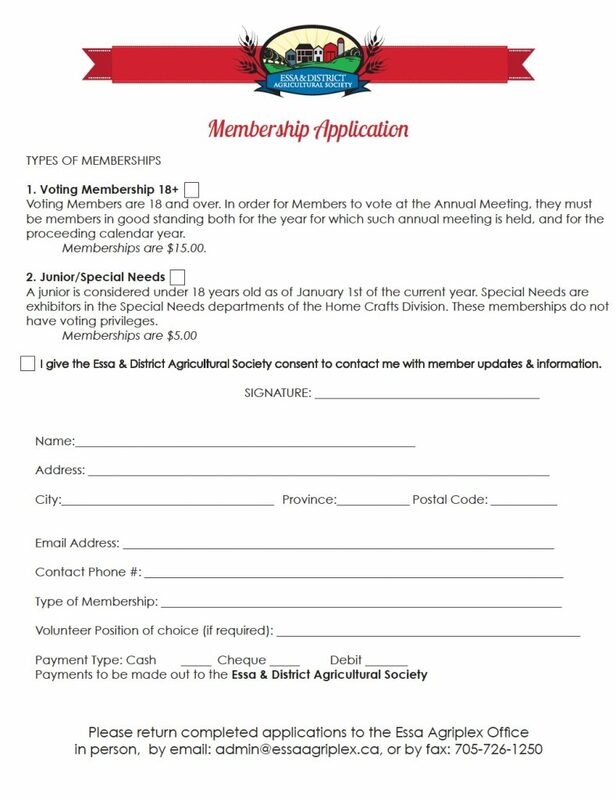 Click below to download the Membership Application. Membership Applications are available in person at the Essa Agriplex office, or to the right at the top of this screen. Completed applications can be returned in person or via email to admin@essaagriplex.ca.